When you think about your favorite children's author, who comes to mind? Shel Silverstein? Beverly Cleary? J. K. Rowling? My assistant thinks Lucy Maud Montgomery (she simply adored Anne of Green Gables as a child), but I think -- hands down -- Roald Dahl. While the Harry Potter series was nothing short of amazing and while the adventures of Ramona Quimby and her sister Beezus were indeed endearing, think about it: Charlie and Chocolate Factory, James and the Giant Peach...do any other children's novels sound as delicious and fitting for a budding baker? Oh, the thrill of exploring a chocolate factory. Oh, the things I could make with a massive peach! Imagine my excitement when my assistant was invited to co-host a Roald Dahl-themed brunch party with her friend Julia. James and the Giant Peach Cobbler, Charlie and the Chocolate Factory Fondue, a cocktail punch bowl inspired by George's Marvelous Medicine -- my head was spinning with ideas. My assistant decided to do what we do best: cake. 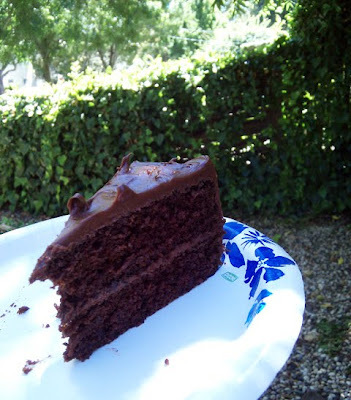 Why not bring a rich, fudgy cake as homage to Bruce Bogtrotter of Matilda -- the boy who triumphantly devoured a gigantic chocolate cake as punishment for stealing a slice belonging to wicked Miss Trunchbull? 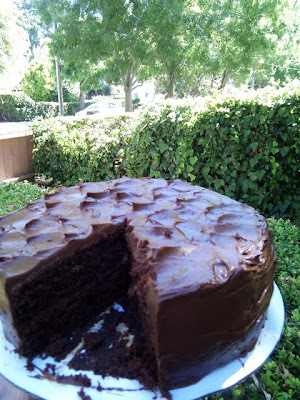 Two layers of moist chocolate cake frosted with creamy chocolate buttercream -- Miss Trunchbull's Chocolate Cake, as we called it, was a perfect ending to a bountiful brunch. Thanks, Julia, for hosting a scrumdiddlyumptious party. Reader, do you remember which book that was from? Yikes! That looks so moist I could drink it. Yummy!